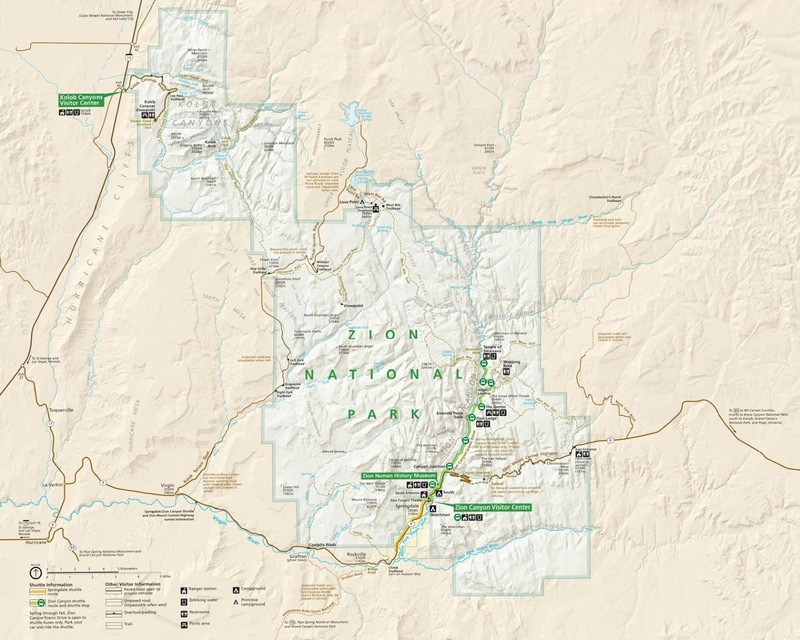 The Archeology Trail is located in Zion National Park. The short trail leads to an ancestral Puebloan ruin on a small mesa above the Watchman Campground and Zion Canyon Visitor Center. The South Gate Petroglyph site has also been included with this post. The South Gate Petroglyphs are located across the highway from the South Campground within about 100 yards of the road. 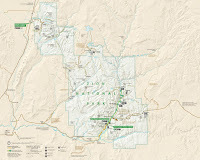 Taken together, both sites are worth visiting for anyone coming to Zion National Park that are interested in such activities. The trailhead to the Archeology trail is located behind the Visitor Center across the entrance road to the Watchman Campground. The trail is among those on the list of recommended hikes within the park. The trail climbs at a moderate slope around the east side of the small mesa. There isn't much to see in the way of ruins once you reach the location. Just the knowledge that a pueblo once stood here is significant when you give it some consideration. The builders would have picked this location because of its closeness to food and water and its elevated defensible vantage point. They may have planted their crops of squash and corn near the base of the mesa where the soil has more depth and then stored their harvest in the pueblo where they could protect it. A kiosk at the top of the hill gives an artists interpretation of how a small pueblo may have appeared at one time. The sign at the trailhead mentions that all pottery sherds have been removed from the site but apparently they didn't get them all. This shard, bigger than a silver dollar, was laying next to the trail on the hillside. As it is illegal to remove or even dig for artifacts we can only hope that it will remain there for future visitors to admire. The views from the little mesa are nothing short of astounding. Maybe another good reason to build a home at this spot. There is not a trailhead or parking area for the South Gate Petroglyphs site. There is a trail from the road to the boulder that contains the rock art. If you look carefully across the road from the South Campground you should be able to see the kiosk and even make out the petroglyphs that are on a large boulder. The petroglyphs at South Gate are from the Archaic Period about 2500 to 7000 years ago. Spiral petroglyphs are often associated with solar or calendar sites. This particular spiral has 3 1/2 turns. On the 21st of June, at the summer solstice, a shadow is cast on the rock that is said to resemble a coyotes mouth. Zion National Park has other archaeological sites that are kept mostly secret to protect them from vandalism. With these two sites so easily accessible interested visitors can add them to their list of things to do while in the park. If you would like to see them for yourself then all you have to do is 'Take a hike'.